Don Edwards retired from the presidency of The American Boychoir School in Princeton, NJ in January 2007, after many years of service as trustee, Vice President for Institutional Advancement, and President. ABS is a fully-accredited residential middle school for 80 boys in grades four through eight who make up the nation’s pre-eminent boychoir. Edwards’ work in arts education followed a long career at Rutgers, The State University of New Jersey. After serving as Associate Dean of Livingston College and Executive Assistant to the President, he became Vice President for Public Affairs & Development in 1976. In 1993, he was named Vice President for Government Relations. He served on the Board of Directors of the National Association of State Universities and Land Grant Colleges and chaired its Council on University Relations and Development and its Task Force on State Relations. 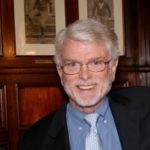 Edwards’s volunteer activities have included service as Senior Warden of Trinity Episcopal Church in Princeton and as People’s Warden of Christ Church, New Brunswick. He was a long-time trustee of the Procter Foundation, which supports Episcopal campus ministries at Princeton and Rutgers. After graduating from Yale, Edwards did graduate work at Princeton Theological Seminary and Rutgers before becoming director of intern programs in the New Jersey Department of Community Affairs. Two years later, he came to Rutgers to help establish Livingston College and shape its multi-racial, urban affairs mission.